Maybe I should have titled this QUICK GIVEAWAY, because the winner will be announced on Monday. 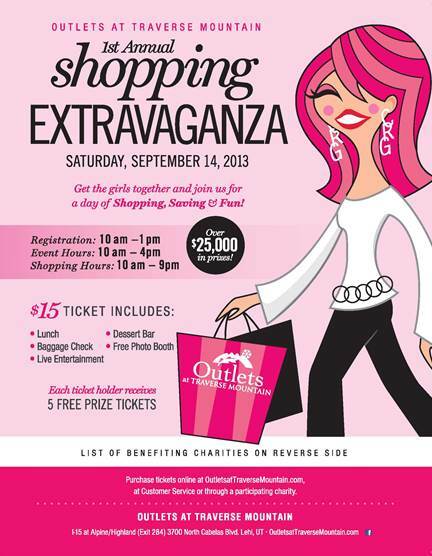 WHAT: Enjoy a day of shopping, saving and fun! Each $15 per ticket includes lunch, a dessert bar, live entertainment, and five free prize tickets for a chance to win $25,000 in prizes and more. WHY: All proceeds will benefit the Boys and Girls Club, Child Help Wasatch Front Utah Chapter, Friends of the Food & Care Coalition, Habitat for Humanity of Utah, Kid History Foundation, Make-A-Wish Utah, Project Read, Utah Foster Care Foundation, Yes! Utah Organ Donor Registry and Youth Making a Difference. I was really looking forward to attending, but then I looked at my calendar, and for me? It's not happening. So I'm having a giveaway for my two tickets (valued at $15 each).